I love fall. And this year has been especially nice. (Well, especially nice after the temperature finally dropped below 90 on a regular basis). Cooler weather means many things. It means it’s time to break out some of the warm-weather clothes like sweatshirts and jackets, and, for me, long shorts. I love the sights and sounds of fall. the hues and contrasts of foliage, the smells, and the lower sunlight and earlier dusk. One of my favorite things to do when the weather is cooler is to make homemade soup. I’m not sure what it is about soup in the fall, but it’s always special to me. I break out a jazz cd and set to work cutting up the meat, carrots, onions, and potatoes. I cook the meat first. Once I have it cooked and some water and seasonings added, the whole house begins to feel warm, and a wonderful aroma fills the air. My daughter almost always mentions how good it smells soon after it starts cooking. And it brings about a peace and calm to me. I’m never in a hurry: sunlight spills into the kitchen from the window over the sink, my jazz is playing in the background (this week it was Keith Jarrett and the Koln Concert) and my son is often enjoying the cool autumn outside as he rides his scooter or just enjoys being a kid. Inside I work at a leisurely pace. 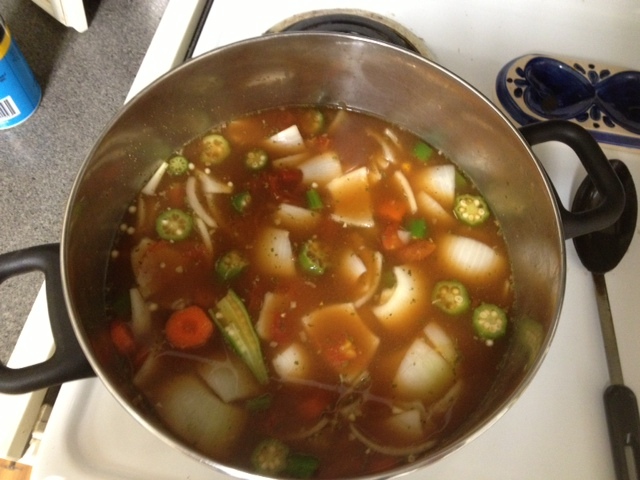 Once I have all the ingredients in the soup, I wash up the dishes that I can and enjoy the sound and smells of it all. I taste the soup from time to time, just to make sure it has a good flavor (wink, wink). And it almost always does. Then it’s time to eat. The soup always has a warm, healthy taste and feel to it. After eating it, I always feel better. The whole experience has a feel of home to me. I guess because I enjoyed it so much when I was growing up. My dad would often make soup on a cold day, and when I got older, he would get me to help. I liked the soup then, too, but not as much as now. This past week, my son asked if he could help. I let him peel the vegetables and put in all the ingredients. I couldn’t help but smile as he sampled bite after bite just to make sure everything was just right. Making soup is a simple experience. Not one that you can buy online or experience at a big venue. But it’s the simple experiences that make up our lives. And create the memories that we hand down to our kids in the hope that they’ll enjoy it as much as we do. ← But is he old enough to shave? I can relate… This fall I’ve already made chili, borscht, tomato bisque, gumbo, and African chop. Nothing like soup and cool weather. All that sounds really good. I’ve made chili a couple of times. The problem is, I don’t wait for fall to make chili. There was one stretch last spring/summer where I made chili about 7 straight weeks. But I need to find some new soup recipes. What are a couple of your favorite soups? Thank you, Katherine. I’m glad you enjoyed the post. Prepare the corn first. Using a sharp knife, cut the kernels off the cobs and place in a bowl. Be sure not to cut too close to the cob, you want just the soft crisp nuggets of corn. Then you want to “milk” the corn cobs. This basically means you want to squeeze all the pulp and juice out of the cob, this will help make the soup nice and creamy. I used my mandoline to slice the cobs of corn over a bowl. 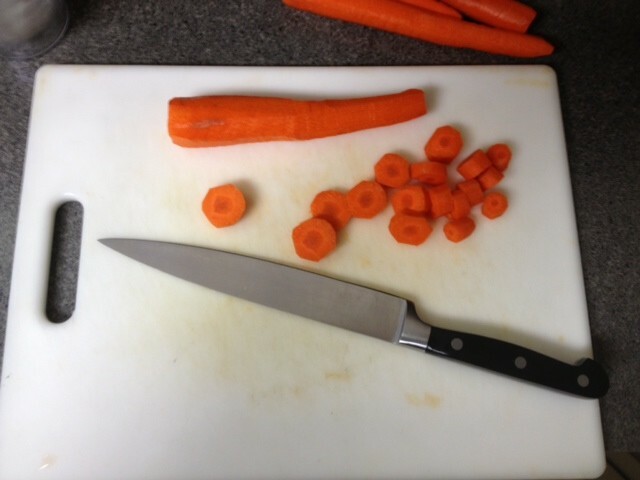 Then I quickly ran the back of a knife down each cob to squish out the rest of the juice. In a large stock pot or dutch oven, heat a few tablespoons of olive oil over medium high heat. Add the pancetta and saute until most of the fat has rendered off and it is starting to get crispy, about 6-8 minutes. Remove the pancetta and set aside. Reduce heat to low and add the onions and butter. Cover and cook until onions have softened, stirring occasionally, about 12 minutes. Add the garlic and saute for 1-2 minutes. Make a roux by sprinkling the flour over the onions and whisk for a minute or two until the flour is combined with the butter and onions and just starts to brown. Slowly whisk in the stock and bring to a simmer. Add the potatoes, bay leaf, thyme, juice from the corn cob, whole milk, and the cooked pancetta. Bring back to a simmer and cook over low heat for about 15-20 minutes, until potatoes are nice and tender. Add the corn, heavy cream and sugar, bring to a simmer again, and cook until corn kernels are tender but still crisp, about 10-15 minutes. Take out the bay leaf and serve topped with the chopped parsley and even some grated parmesan cheese. Thanks, Pat. I am going to try this in the next week or two. I can hardly wait! It sounds delicious.